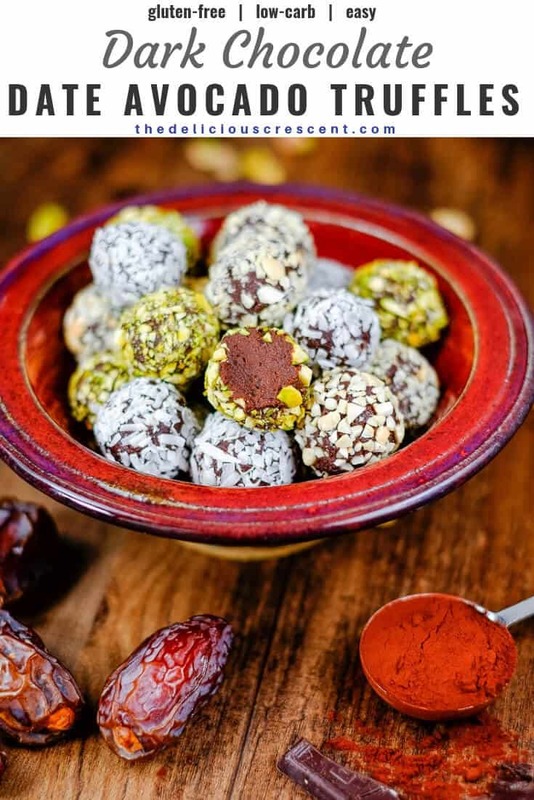 Luscious Date Avocado Chocolate Truffles are a decadent melt-in-your-mouth treat. With “no” heavy cream or butter. Minimal added sugar and saturated fat. Traditionally chocolate truffles have been made with a good amount of heavy cream and butter, both of which are rich sources of saturated fat. A diet that is high in saturated fats is not good for health. And most of the foods that fall in the “decadent” and “indulgent” category have a ton of saturated fat. Nature has blessed us with a variety of fat sources. So here again, I am trying to make the best use of that bounty. 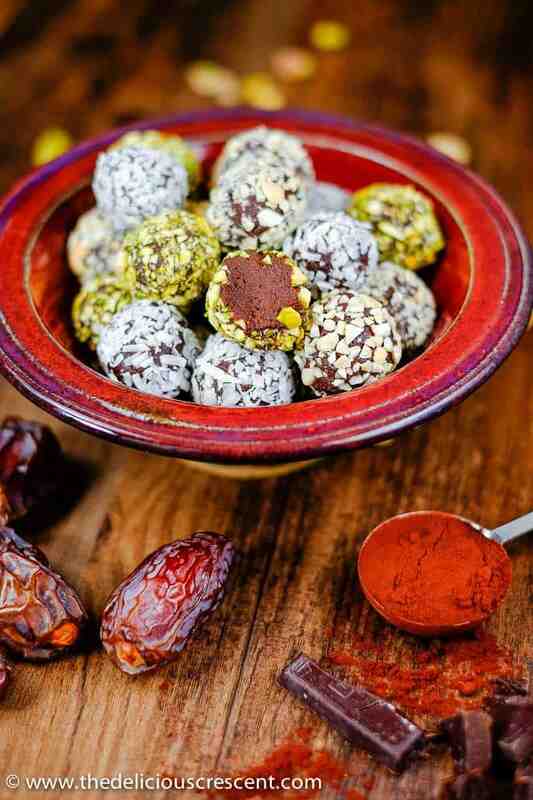 These Luscious Date Avocado Chocolate Truffles are utterly fantastic. Both dates and avocado lend a luxuriously smooth texture. The avocado mainly substitutes for cream and butter. And most of the sweetness in this treat comes from the dates. Some of my favorite avocado based recipes – Healthy Rose Milk and Creamy Leek Avocado Soup. And you would not want to miss these amazing date filled cookies – Maamoul Cookies and this rice with dates added – Lentil Cranberry Saffron Rice. Unlike refined sugar, the date fruit is naturally rich in some minerals and vitamins. While traditional medicine has touted its medicinal properties, modern research has revealed that dates are a rich source of phytochemicals such as phenolics, carotenoids, flavonoids and procyanidins: compounds that are known for several health promoting benefits. Not to mention the fact that dates are an excellent source of dietary fiber. Avocados are a delicious source of heart healthy fats, phytochemicals, fiber and other nutrients. For more about this wonder fruit you can check out this Creamy Leek Avocado Soup. Here I use only a fraction of chocolate as compared to what would be needed in traditional recipes. But the chocolaty taste comes from the addition of cocoa. To flavor the truffles, I have used orange zest as I think that orange and chocolate are a match made in “Food Heaven”. But it can be substituted with vanilla, almond, cinnamon or whatever flavor you may fancy. Talking about chocolate and alternatives to butter, you may love to try this recipe – Chocolate Hazelnut Honey Crescent Rolls. I have to mention that homemade truffles typically have a short shelf-life and should be consumed within a few days after making. 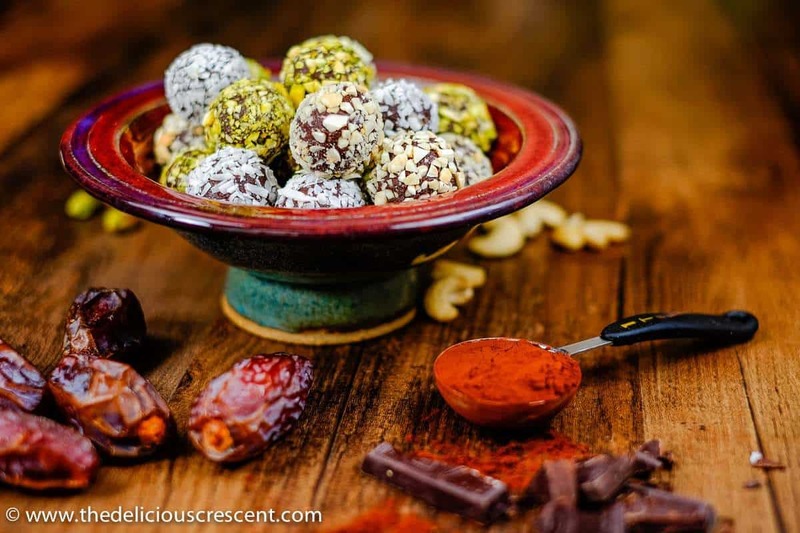 Although, I think that you may not really need to worry about shelf-life as these Luscious Date Avocado Chocolate Truffles will deliciously disappear!! 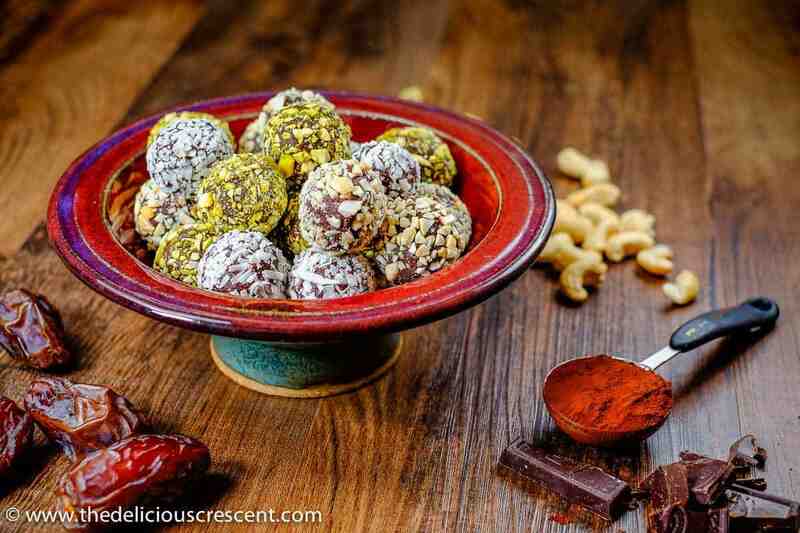 Luscious Date Avocado Chocolate Truffles are a decadent melt-in-your-mouth treat. With "no" heavy cream or butter. Minimal added sugar and saturated fat. Chop the pitted Medjool dates and process into a paste in a food processor. Melt the semi sweet chocolate in a double boiler or a small bowl set over a pot of steaming water. Stir gently as needed. Do not over heat. If using a temperature guide, suggested temperature is 90 to 93 degrees F.
Add the melted chocolate, avocado, cocoa powder, orange rind, pinch of salt. Process it to a smooth paste in the food processor. Spread the truffle mixture over a plate and leave it in the refrigerator overnight. Using a teaspoon or a melon baller scoop out 2 teaspoons of the mixture and shape into smooth truffle balls and place it in a plate. Roll the truffles in the toasted chopped nuts or coconut and place in a parchment lined container. If you prefer to coat the truffles with chocolate, then melt the bittersweet chocolate in a double boiler as mentioned above. Dip a metal measuring tablespoon or an ice cream scoop and turn it over to drain the excess chocolate. Place a truffle ball in the scoop and gently roll to coat with chocolate using a fork or a small spoon as a guide. Then roll the chocolate coated truffles carefully in the nuts or coconut. Place the truffles in a parchment lined container. Allow the coating to firm up for about an hour. 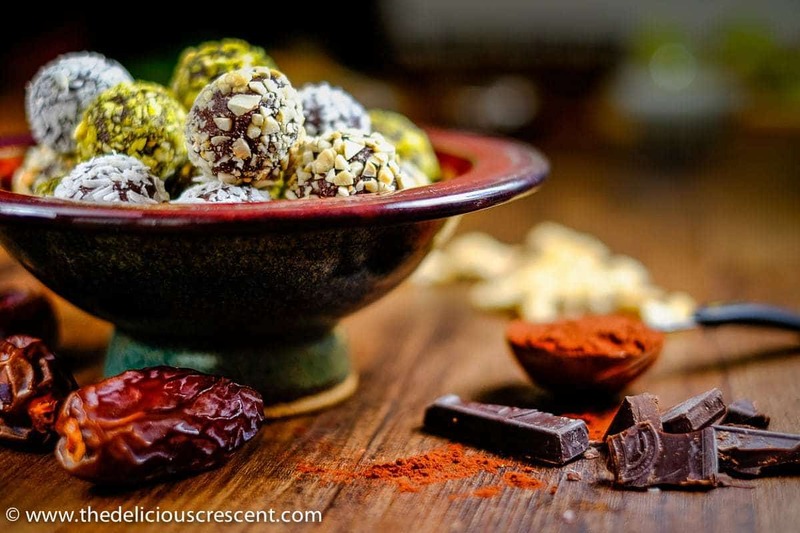 Store in an airtight container in the refrigerator and enjoy the Luscious Date Avocado Chocolate Truffles. The consistency of the truffle mixture may vary slightly depending on the moisture in the dates. If needed, adjust the consistency with some extra cocoa powder. The recipe lists the exact amount of nuts, coconut and bittersweet chocolate needed to coat the truffles. You may start with slightly greater amount of these ingredients for ease of rolling and save the rest for other use. Check to make sure the ingredients in the brand of chocolate used for making these truffles are “Gluten Free, Egg Free, Soy Free” as needed. More tips in the blog post above. These look just perfect. Love how moist they look and that you rolled some in pistachios. Thanks Ginny. Yes the center is creamy. I love avocados but I haven’t tried them in a dessert recipe before. I’ll need to make these! Thanks Jill. Let me know what you think. Ohhh yum! I’m always amazed at the things avocado can do! These look great! Thanks Liz ?. Yes I agree. Avocadoes are pretty amazing. And I love to experiment with them. Love this idea of lightening up the truffles without sacrificing texture or flavor! Marking for holiday use! Thank you so much Noel. I plan to add a video for this one. Hope you enjoy it!! I love using avocado to make chocolate “pudding”, but I’ve never thought to use it in this way. These look delicious! Yes Kara I love the pudding too. So quick and yum. Thanks.